Fitness and the appearance of fitness have become an obsession in our culture. Our torso shapes are revealed in form-fitting clothing, in athletic garments and in the minimalist swimsuits for which there are little in the way of alternatives. Since mass-produced clothing took the place of made to measure, we have been forced to wear clothing which is standardized, whereas our bodies are not. You may feel what I call “The tyranny of prete-a-porter” ( ready to wear). Next to concern with breast size, shape and position the most common request for help we see is with the abdomen and the body “core”. No matter how hard you exercise, and no matter how diligent you are you’re your diet, sometimes ( especially after pregnancy has separated the muscles), the only remedy is a tummy tuck. I aim to get you confident enough in your appearance for you to get back into a two-piece bathing suit, and while we can’t guarantee this will occur, in most cases it does. Think how much better you would feel if you no longer felt like covering up. Dr. Benjamin Gelfant takes you through the procedure so you know exactly what to expect. Viewer discretion advised — Video shows actual footage of the operation, some viewers may find scenes disturbing. Should I wait to have a “tummy tuck”until I have had all my children? In general, if you are planning to have more children, some of the benefits may be lost. However, if you have lost weight and have excess skin as a result, feel self-conscious about your appearance, the results of surgery may justify the operation at any time. Won’t liposuction take care of it? When there is skin looseness and the underlying muscles are stretched, suction will not improve the appearance and may worsen it. When there is significant fat and some skin looseness, suction won’t give a satisfying result, and may even, make matters worse. Once in a while, I see a patient for whom it’s reasonable to start with a preliminary suction operation, with the understanding that a secondary tummy tuck may be needed. Do I need to have such a long scar? The incision length depends mostly on how wide an area of skin is removed, and this is related to how loose the skin is. In an abdominoplasty (tummy tuck), when all the skin below the belly button is removed, the scar usually runs from hip to hip. Less looseness requires a smaller incision. I encourage walking during the first few days, light aerobic activity at two weeks, and full exercise routine with abdominal exercises at six weeks. What about Cool®Sculpting and other non-surgical treatments? Again, if you have loose skin and muscles, this won’t help. **Failure to follow these instructions may lead to cancellation of surgery and further fees will apply. Sorry, no Blog Posts tagged as Abdominoplasty / Tummy Tuck. 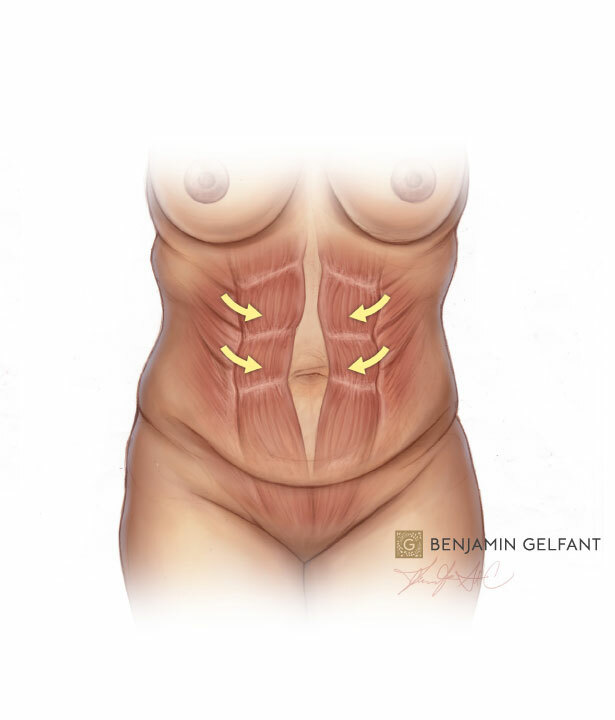 Although mini-tummy tucks, which involved smaller incisions, were popular when I first started practice, the results often were significantly compromised and a return to longer incisions became the usual approach. As with small incision breast lifts, scars fade over time, but if the contours aren’t improved dramatically, a shorter scar is no advantage. 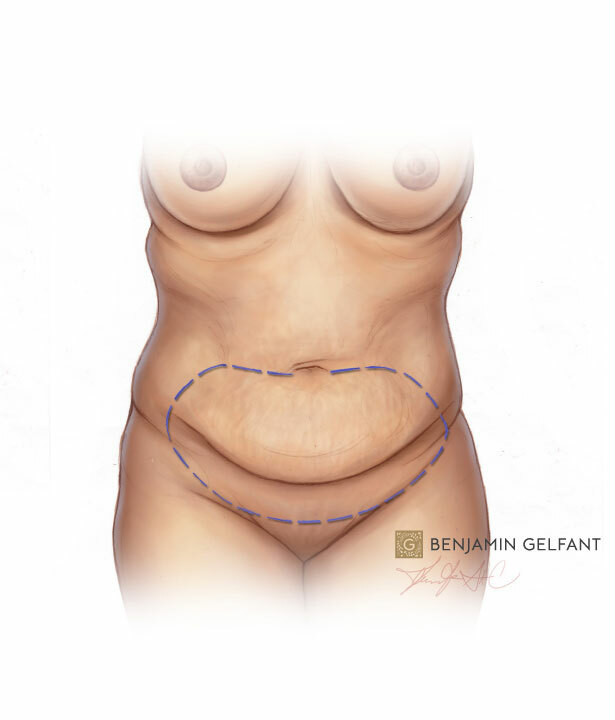 The average patient, who comes with skin looseness ( “laxity”) and some excess abdominal fat after pregnancies or previous surgery needs a full abdominoplasty with a traditional incision. In fact, the most common form of abdominoplasty which I currently use is not a lesser variation of a traditional procedure, but is, instead, more extensive, because so much more is known about how to achieve the best results. Surgery is done under general anesthesia ( completely asleep). We add local anaesthetic by injecting it at the start of and during surgery which helps to minimize post-operative pain. The incision is now created (VIDEO) and the skin of the abdomen is separated from the underlying muscle layer, first up to the belly-button, which is next separated from the surrounding skin and left in place, we then carry on into the upper abdomen and up to the bottom of the breastbone, minimizing how much we separate the skin near the rib margins in order to preserve circulation and sensation as much as possible. The muscles of the abdominal wall are now visible, and the rectus abdominis muscles ( the ones you use to do “crunches” and “sit-ups”) nearly always are separated after pregnancy ( diastasis recti). I bring the muscles back together with a series of stitches in two layers. Here’s where I get to be a tailor, a disappearing craft, in our culture. 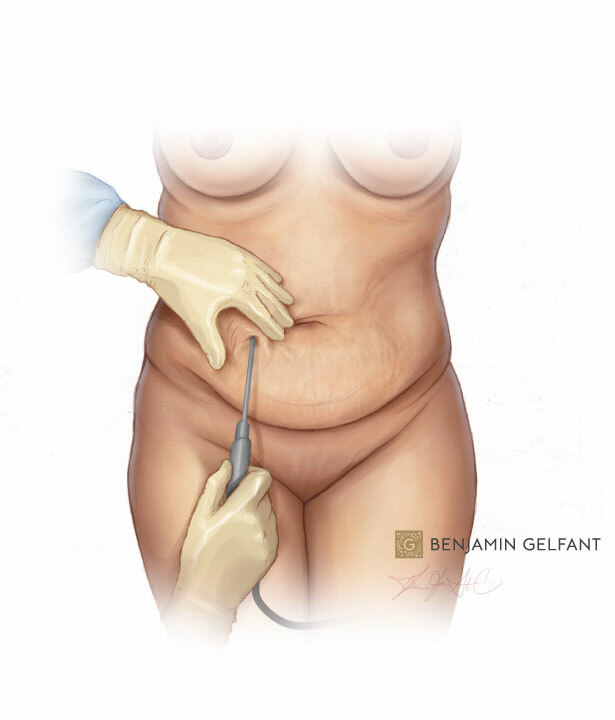 Traditional abdominoplasty involved until the surgeon could bring the cut edge at the top of the belly button hole and removing everything in between, often needing to flex the surgery bed to an extreme, just to bring those edges together, and with no regard to any other judgement. This often left patients unable to stand up straight for weeks and weeks. It also put a lot of strain on the incision repair, and led to all sorts of healing problems and widening of scars. I think it also caused an increased risk of Venous thrombosis (blood clot), a feared and potentially lethal complication. As a result, we first estimate the amount of skin removal with gentle flexion of the OR bed, and then proceed to use a series of “basting” stitches in the SFS to further refine that estimate. Finally, the skin removal takes place with minimal tension planned. I keep my tummy tuck patients overnight. Most of my patients have small kids at home and it is impossible to get started on recovery properly when, naturally, they want your attention. But even when that’s not the case, going home immediately after a tummy tuck is not easy, no matter what pain relievers are used or whether there is a local anaesthetic “pain pump” ( I don’t use them) used. Spending a night in clinic is never seen as a waste. You are in expert hands with professional experienced nurses and I think this enhances the recovery. Intermittent venous compression pumps are used to keep blood flow in the legs until patient is up and moving about. The nurses give post-op teaching especially about our preventive measures for venous thrombosis. and I see my patient the morning after surgery. The drains come out at somewhere between six and eight days after surgery, on average. In the first week, walking about is a little uncomfortable and this changes quickly after drains are removed so they can stand up straight. Most patients are back to work in two weeks. We begin exercise with walking early, and progress rapidly during the time from two to six weeks. Abdominal exercise can be started as early as a month in selected cases and almost always by six weeks. Scars heal (mature) according to a schedule individual to each person, but generally look their worst between 6 and 8 weeks after surgery, stabilize, and then begin to soften and fade, a process that takes from six to twenty-four months. 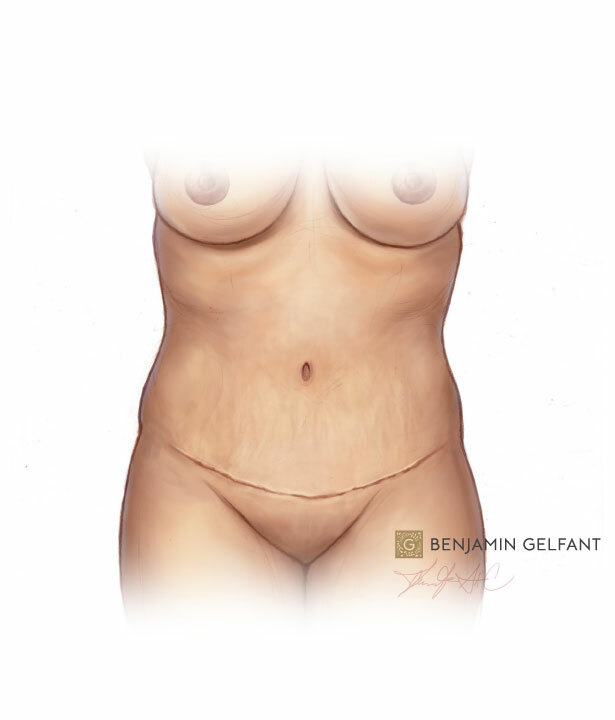 Abdominoplasty, and the related body contouring operations, all share similar risks and possible complications. Like all surgical procedures, bleeding or infection can occur, although both are unusual. If they do occur, they may require surgical treatment, hospitalization, or may be managed with lesser measures in some cases. Infection, when diagnosed early and not severe, may respond to antibiotics by mouth, for example. Problems with poor or delayed healing of the incision can occur, leaving areas with widened scars after crust formation. This is a many times greater risk in smokers. All smokers must quit for this surgery.